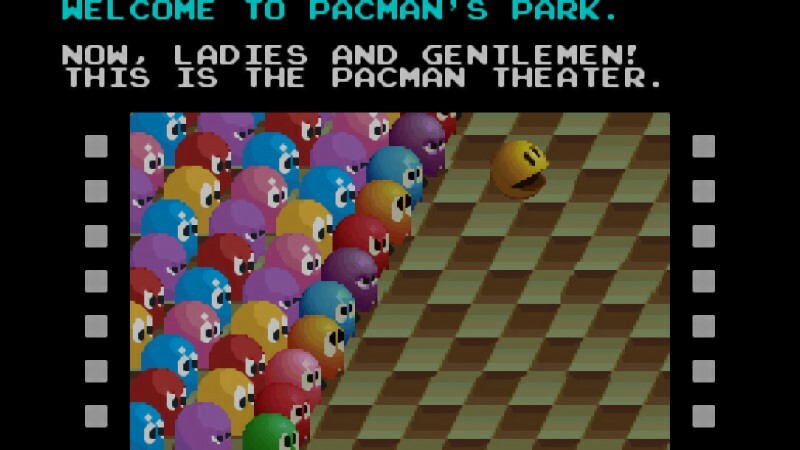 This game actually released on the Wii U Virtual Console last summer, but with the 35th anniversary of Pac-Man’s arcade debut still fresh in mind I thought now would be a good time to do a retro review for Pac-Man Collection. It’s a packaging of four old arcade games, first releasing on the Game Boy Advance back in 2001, with various settings to tweak the experiences. Although it falls short in a couple areas, overall it’s a very fun compilation at a good price. 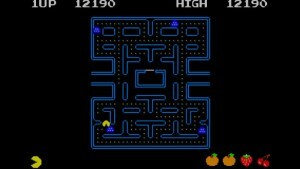 The original Pac-Man, that everyone knows, is of course included, with the welcome option to play in full screen or scroll. While this game’s importance can’t be overstated, it also must be acknowledged that the followup, Ms. Pac-Man, is the much better game, one that’s not included here. Still, who can resist taking the original classic for a spin now and again? 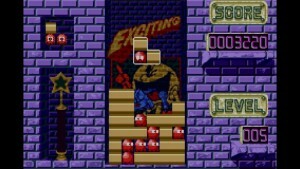 Pac-Attack is a Tetris like block dropping puzzle game. Certainly not a bad title, though probably the weakest of the bunch. It recently got a standalone Virtual Console release, although this version obviously represents the better value for the solo gamer. There is no vs. mode, but normal (endless) and puzzle (100 stages) are included. Pac-Mania is perhaps an underrated game in certain respects, and will likely grow on you the more you play it. The isometric perspective is cool, and the jumping mechanic is smoothly implemented. 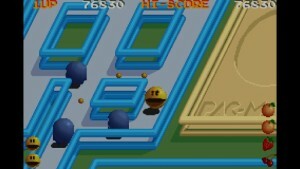 The game starts in Block Town before moving to Pac Man’s Park, Sandbox Land, and lastly Jungly Steps. Definitley a challenging game, but one with the potential to get you hooked. Pac-Man Arrangement in all likelihood is the star of this collection. It’s 3-D levels are vibrant, and loaded with new elements like fresh enemies and power-ups, dash arrows and more. The mazes aren’t always flat either, putting a new take on the pellet-munchin’. The one drawback in my mind is that continuing puts you immediately where you left off, rather than back at the start of the maze. I’m glad for the unlimited continues mind you – all arcade games should have them as an option – but a more moderate approach might have been better in providing more challenge. 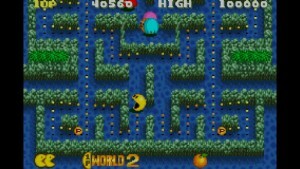 For all its strengths, there are a couple things lacking in Pac-Man Collection. A proper means to save high scores is one such omission. If playing on the Wii U top scores can be saved via restore points which helps some, although the game is a superior fit on the GBA. The control also can’t match that of the arcade, although how much this bothers may depend on experience with the coin-op’s. Pac-Man is a video game icon, and what his collection lacks in arcade control and high score saving, it makes up for in fun quantity. 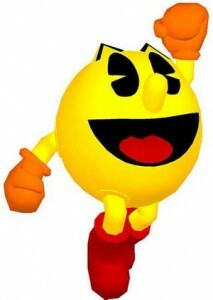 For those who don’t already own these games in various Namco Museum compilations, Pac-Man Collection is a sound buy. It’s an enjoyable package that offers a lot for a small cost. Pac Man is a video game icon, and what his collection lacks in arcade control and high score saving it makes up in fun quanity.